All* Above All is rolling out a new campaign to call out extreme anti-abortion politicians who support the Hyde Amendment and other policies that punish women who need abortion care. The campaign and the ad buy refer to Trump’s comment during his campaign that he would “punish” women who seek abortions, a remark he walked back despite his support for policies which target poor women for denial of abortion coverage. If heartless politicians think we are going to give up on our communities in 2017, they are sorely mistaken. We will be bold, we won’t be punished, and we aren’t going anywhere. All* Above All is rolling out a new campaign to call out extreme anti-abortion politicians who support the Hyde Amendment and other policies that punish women who need abortion care. The campaign and the ad buy refer to Trump’s comment during his campaign that he would “punish” women who seek abortions, a remark he walked back despite his support for policies which target poor women for denial of abortion coverage. 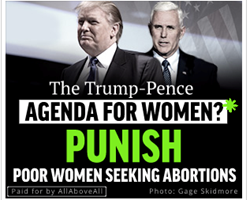 The new campaign exposes the Trump-Pence agenda to shame, bully, and punish poor women and mobilizes supporters to demand that members of Congress stand up to Trump. The Hyde Amendment, a “rider” attached to annual budget legislation, withholds coverage for abortion from women enrolled in Medicaid, and disproportionately harms women of color, low-income people, immigrants, and rural communities. The “We Will Be BOLD. We Won’t Be PUNISHED” campaign includes a six-figure ad buy on the ground in Washington, D.C., and nationwide ads aimed at cultural and political leaders. The media buy includes print newspaper wrappers, digital takeovers, taxi videos, mobile billboards, and social media ads. “People around the country have spent years mobilizing in support of lifting abortion coverage bans. Americans know that the Hyde Amendment literally takes away a poor woman’s decision making about abortion. By disrespecting poor women, these politicians are disrespecting all women – and we will not stand for that. We are starting when Congress comes back to D.C., we will continue during the inauguration, and we won’t let Trump or Pence shred our reproductive rights,” said Kierra Johnson, Executive Director, Unite for Reproductive and Gender Equity (URGE). This new campaign launches on the heels of a bold move by 100 members of Congress who wrote to Trump calling for the elimination of the Hyde Amendment, and builds on momentum generated by the introduction of the EACH Woman Act, legislation to lift coverage bans, a nationwide poll showing support for such a bill, and the first-ever United for Abortion Coverage Week of Action that took place from September 25th to October 1st, 2016. The content of the ads includes messages like the one included below. To request to see all the ads, please reply to this email. The Trump-Pence Agenda for women? Priority #1. Bully/shame/punish poor women for seeking abortions. Stand against the Hyde Amendment. Get the Facts. ALL* ABOVE ALL unites organizations and individuals, including 130 partner organizations, to build support for lifting bans that deny abortion coverage. All*Above All reflects our powerful belief that each of us, not just some of us, must be able to make the important decision of whether to end a pregnancy without interference. Our vision is to restore public insurance coverage so that every woman, however much she makes, can get affordable, safe abortion care when she needs it. Learn more at allaboveall.org and follow our social media at @allaboveall. Photo galleries available: If you are looking for photos to accompany your coverage of abortion and related issues, please check out these galleries.